This patient had a lower face and neck lift with fat transfer throughout her cheeks, folds and temples. Patient had a Facelift years ago with another surgeon. 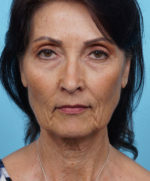 Dr. Balikian performed a revision Facelift with full face CO2 laser to lift the jowls and smooth and contour her skin. This patient had a heavy neck and jowls. Dr. Balikian performed a Facelift to redefine her neckline and jawline. He was able to do this without putting any tension on the skin. This patient was bothered by saggy skin of neck, jowls and loss of volume of face. Dr. Balikian treated with facelift, neck lift, browlift, upper Blepharoplasty and fat transfer to cheeks, temples and marionettes. This patient in her 60s was concerned with the laxity and folding of her neck skin and overall tired look. She wanted to look refreshed. She had a facelift 1 year ago to elevate the structures of her neck. Note the decrease wrinkling of her neck and the decrease in hanging jowl. This patient was most bothered by jowling and poor neckline. Dr. Balikian performed a Facelift 6 months ago. Take notice to the smoother neck and jowls.